The ATV-LP Series of off-road lights consists of low profile high-intensity LED modules capable of being mounted anywhere on a vehicle utilizing automotive trim tape or using our various mounting options. 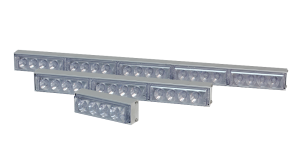 Each segment contains 4 high-intensity LED's. The Modules simply turn ON/OFF with 12V power. Each Module measures 1.5"W x 4.25”L x 1.5"H.